What is it? Vibrant packaging, vibrant components, vibrant setting. Yamatai is a veritable firework of colour on the table as you build routes and palaces all in hope of glimpsing that rarest of sights, a knowing smile from Queen Himiko. But does that vibrancy extend to the gameplay experience? I’ll be honest, the first time I sat down with Yamatai’s rules I just wasn’t feeling it. Perhaps it’s that I certainly was feeling cold and tired, but there seemed something opaque in nature about feeling my eyes drift off the end of each sentence. As effusively colourful as the box art is, as typically Days of Wonder as the components are (very very good), somehow getting stuck into the gears and pistons of the game tempered my enthusiasm. It may have also been the comparisons to Five Tribes that lingered in the back of my mind, a game which I dearly enjoy but could do without a reskinned version. And it’s not that the rules are particularly complex, if anything Yamatai has the shortest rulebook for that weight of game I can recall seeing in quite some time. Did I mention yet how pretty this game looks? I think I’ll just chalk it up to new term fatigue – whilst I can appreciate that games want to define concepts in terms that provide a thematic link to their theme, at some point fancy iconography becomes wearisome. But such is the price for our aesthetic desires. Fortunately I am pleased to tell you that Yamatai For Queen Himiko’s Smile is rather good. Rather, because I’d need to play it at least a half dozen more times to tell for sure and because at this point I still prefer Five Tribes, but the potential is there. But rather good, in an ocean of games, isn’t always enough. Is this the case for Yamatai? I do get the impression that Yamatai’s theme came far later in the game’s germination, that its genesis is more aesthetic than it is practical. Five Tribes certainly isn’t innocent of the same accusation, but what I’m getting at is that the narrative objective is largely irrelevant. 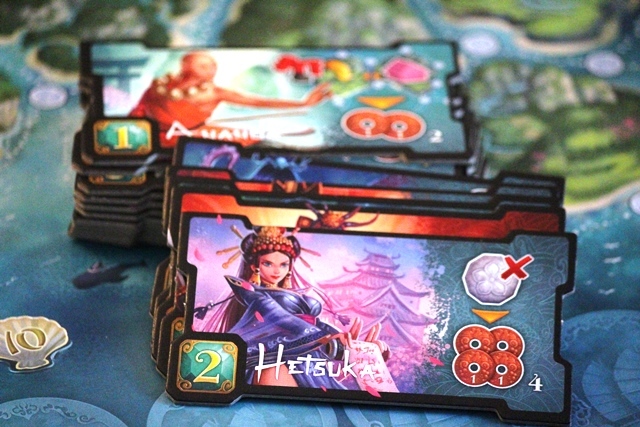 Yes, you’re a builder seeking to please the historical figure of Queen Himiko and build the non-fictional city of Yamatai, but really you’re just racing toward one of four different end game triggers to collect the most points. This is chiefly achieved by placing boats throughout the archipelago of the map, building structures and grabbing up Culture tokens as you go. It is gorgeous to look at. The art is beautiful and bearing witness to the board flourish like a Cherry Blossom over the course of the game is in itself a distinct pleasure, almost like watching a game of Five Tribes in reverse. As any navigator worth their salt will tell you, the key to ensuring your ship doesn’t end up as as timber dressing for a rocky outcrop, or that you end up in Sydney when you meant to reach Kingston, is in mastering a core set of disciplines. Pointing your sales with the wind and hoping for the best isn’t likely to have the most pleasant of outcomes. 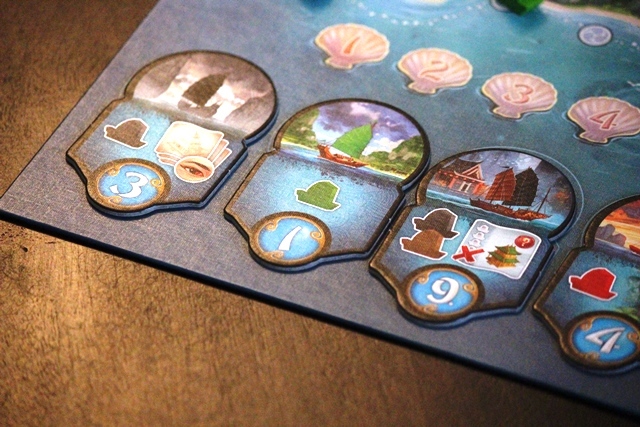 Similarly, Yamatai has three core elements that you need to understand if you expect to do well. Fleet tiles are your first port of call. Choosing a fleet tile from the five available (though the only replenish on the next round) is not only your first action, but it also determines a portion of the boats you’ll have at your disposal and your turn order for the next round. There are ten in the game in total, and for example the tile numbered 10 will if chosen always mean that you will go last in the next round, but it does grant you three boats (with one of the colour of your choosing). Others provide boats and allow you to perform a special ability such as swapping out boats already on the board. The second core aspect is in how you place your boats on the board. Aside from the five starting points, your first boat always has to be connected to a boat of the same color. You do have a Trade action whereby you can purchase or sell a single boat, so along with the boat/s from your Fleet tile you’ll typically be placing 2 to 3 boats on average. There’s definitely an element of Five Tribes here, as the board state is in constant flux and any move you make could just as soon make your opponent beam from ear to ear or generate a lifelong dedication to vengeance. Our last core mastery is the decision to build a structure or claim a Culture token. Tokens are straightforward, you can claim a token from an island adjacent to the route you have placed ships on, per ship placed. What’s the attraction of Culture tokens? Here again the worlds of Yamatai and Five Tribes intersect, as Culture token’s can be used to purchase Djinn’s Oriental equivalent, Specialists. They perform essentially the same function – victory points and special abilities. Hetsuka for example is worth 2 victory points and gives you the ability to exchange a Culture token once per turn for 4 coins. Specialists also gain coins per round whilst unclaimed a la Buildings in Lords of Waterdeep, and there’s a good reason why which I’ll get to in a bit. But what good is a gloriously cultured city without the accompanying architectural wonder? If the allure of Culture isn’t sufficient, buildings are the way to go. Choose a building from the face-up building row – each building has a cost of sorts indicated by the number and colour of boats on the tile – keep the tile in front of you and add one of your buildings to an open island that matches the cost. A Trading Post has 2 green boats and a red boat, which means it can be constructed on any open island that has those matching boats adjacent, with the proviso that you’ve added a boat adjacent in your current turn. These buildings grant not only the victory points listed on the tile, but can score additional coins or points depending on how they’re placed. And that’s the crux of proceedings right there. Sure, there are others rules such as limits to the number of boats you can store and additional ways of messing with your opponents, but that as they say is the noodles and dimsum of the gameplay. 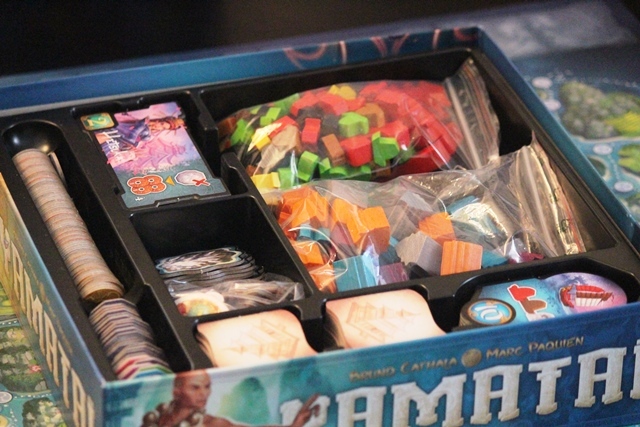 There’s a definite sense of familiarity that will appeal to fans of Five Tribes. The risk/reward of sacrificing turn order for greater benefit, the difficulty of planning long term, the perceived value of the Specialists. But the major difference is that while Five Tribes is essentially a game of pattern recognition, Yamatai has a focus on pattern building. And this translates to the area in which Five Tribes picks up most of its flack for, namely Analysis Paralysis. See, pattern recognition is a skill which improves with practice. Your first few games of Five Tribes may often take double the advertised game length, but the more you play, the better you get at recognising the best moves and what used to feel like an age between turns develops a far better pace. 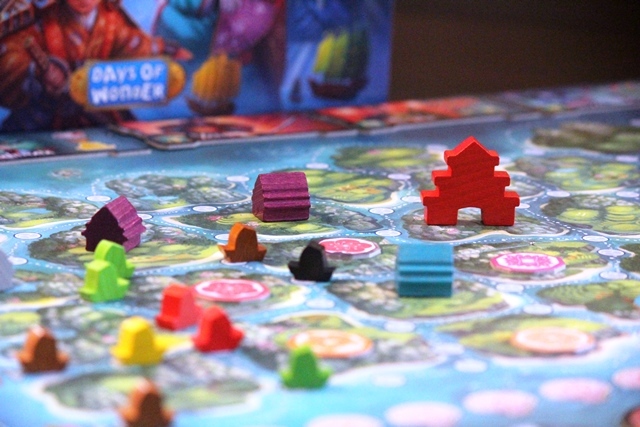 With Yamatai however, you feel as if you’re making a number of significant decisions in your turn – which fleet tile, do I need another boat or more coin, do I build or collect Culture tokens – and this process while certainly growing quicker as familiarity breeds, remains vulnerable to the curse of AP especially at 4 players. That’s not a criticism as such, those decisions are all interesting to mull over, but if AP was a bugbear for you in Five Tribes you’re not going to find a cure for it here. 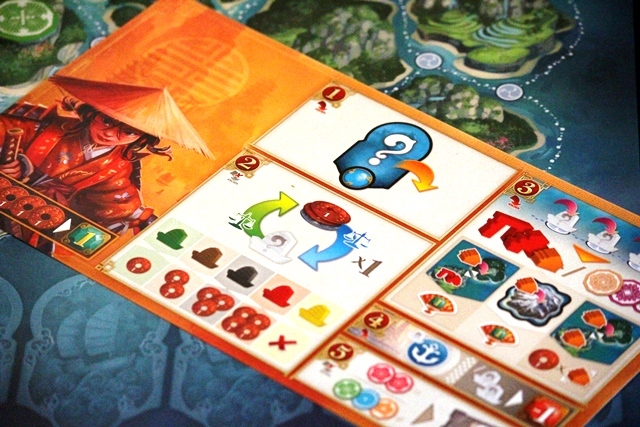 Whereas Five Tribes is like racing through a city metro, making course adjustments to track the green lights, Yamatai is more like working out what traffic light adjustments are needed to ensure the best traffic flow. And yes, I do recognise the irony of using the word fast in reference to Five Tribes. But you get the point. I’d have also preferred the Specialists to feel more powerful. Electing to choose culture tokens over building is quite the sacrifice and there was a definite sense of not quite getting what you paid for. Certain specialists also hold far more consistent value over others – in particular the Specialist who makes every 3 coins worth one victory point instead of every 5 will hold value in every game, whereas others are far more situational. I mentioned earlier that coins accumulate on unclaimed Specialists each round, and one gets the sense this was deemed necessary to incentivise toward seeking Specialists more often as ignoring this aspect of the game could more than conceivably still lead to victory. The game also attempts to throw in some negative points to stir things up a tad, but this aspect feels very underdeveloped. You may potentially lose points for any unused boats left on your player mat, or any building tiles you’ve reserved but not been able to complete, but as it’s easy enough to spot when the end game is closing in and since it’s easy enough to deploy boats to the board, we certainly never experienced any level of dread at the thought of losing a point or two because it’s unlikely to happen unless you take massive risks. There’s also a touch of player interference in that certain abilities might allow you to block off an island for other players, but this feels tacked on and dialing the antagonism a few notches higher than the more friendly sense of competition the rest of the game creates. 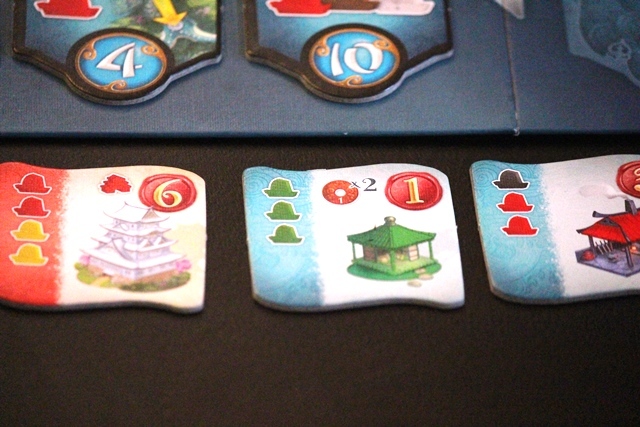 In the plus column though is just how tight a game of Yamatai feels, where 2 or 3 points can make a massive difference. No run away leaders, no identifying the winner two rounds from the end – since one of the end game triggers is player driven (placing your last building) there’s that fantastic bit of mental wrestling you have to endure over just when to end the game, as you’re never quite certain when it’s in your favour to do so. 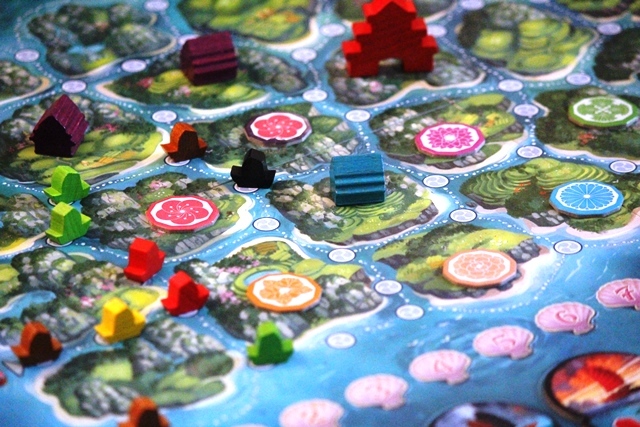 I also realise I’ve compared it to Five Tribes a number of times, and whilst that feels like a fair comparison to make given the many shared qualities, Yamatai is absolutely not just a reskinned clone. Despite the familiarity in the style of play, they do play significantly different. It’s a solid game that will appeal to many and more than likely be enjoyed by them. And if you’re a fan of the approach Days of Wonder takes toward its titles, Yamatai remains very much within their wheelhouse. But it also feels like a title that will only make the jump from solid to superb come expansion time. Given Days of Wonder’s track record, that expansion will more than likely see the light of day. If you’ve seen the game in action and enjoyed what you saw, by all means go for it, but my recommendation at this stage would be a ‘wait and see’. With thanks to Solarpop for the review copy on loan. Yamatai is a Days of Wonder production in every sense. Excellent components, ease of play and wide ranging appeal, but also not wildly innovative or thematically deep. It's not proven to be quite as popular as Five Tribes, and with good reason, but it does enough to wear the badge proudly.